"A great escape. An incredible true story." Bleecker Street Media has unveiled an official US trailer for the film Papillon, a remake of the 1973 film Papillon starring Steve McQueen as Henri "Papillon" Charrière. Both films tell the same story of a French safecracker from the Parisian underworld who is framed for murder and condemned to life in the notorious penal colony on Devil’s Island. This film seems to tell his entire life story of how he got there and how he escapes, while the original 1973 film focuses mostly on his time on the island and eventual escape with another prisoner. 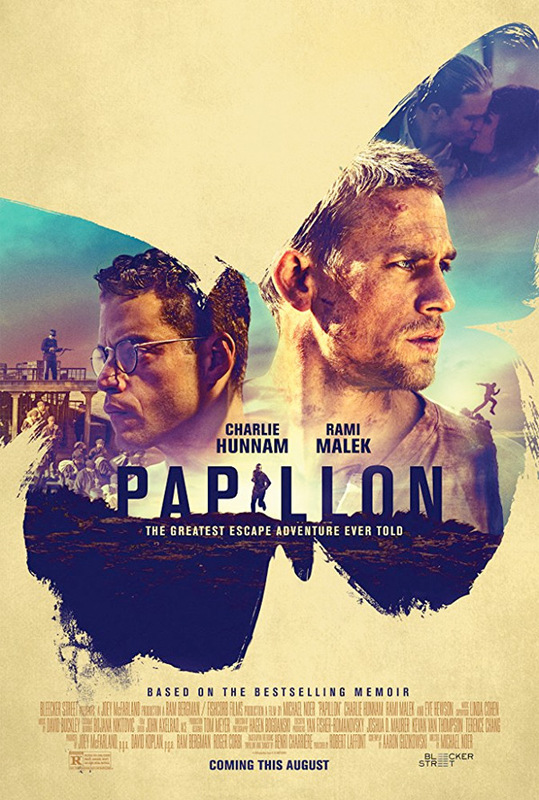 The cast of this Papillon film includes Rami Malek, Eve Hewson, Roland Møller, Michael Socha, Christopher Fairbank, Brian Vernel, and Ian Beattie. This looks like a thrilling, harrowing prison film that tells a very impressive life story - but I don't think it will top the original. Not too much buzz out of TIFF last year where it first premiered. Dive in. A prisoner detained on a remote island plots his escape. A remake of the 1973 film Papillon. Follows the epic story of Henri "Papillon" Charrière (Charlie Hunnam), a safecracker from the Parisian underworld who is framed for murder and condemned to life in the notorious penal colony on Devil’s Island. Papillon is directed by Danish filmmaker Michael Noer, director of the feature films R, Northwest, and Key House Mirror previously. The screenplay is written by Aaron Guzikowski, based on Henri Charrière's book. This first premiered at the Toronto Film Festival last year. Bleecker Street will release Noer's Papillon movie in select theaters starting August 24th at the end of the summer season. Who's interested in seeing the film?